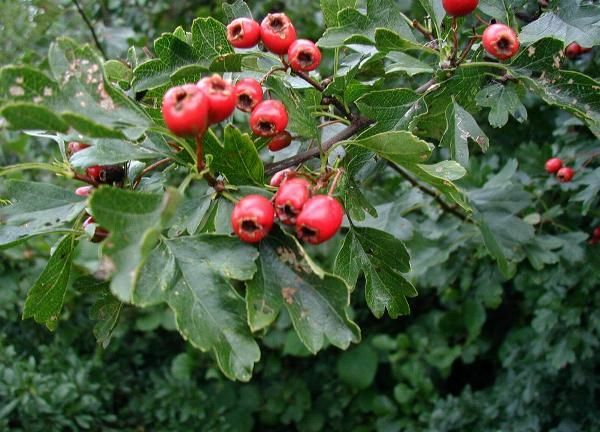 The fruit of hawthorn, called haws, are edible, but are commonly made into jellies, jams, and syrups, used to make wine, or to add flavour to brandy, rather than eaten fresh. Botanically they are pomes, but they look similar to berries. A haw is small and oblong, similar in size and shape to a small olive or grape, and red when ripe. Haws develop in groups of 2-3 along smaller branches. They are pulpy and delicate in taste. In this species (C. monogyna) they have only one seed, but in other species of hawthorn there may be up to 5 seeds.